Hard Candy is having everything at 75% off on their website. 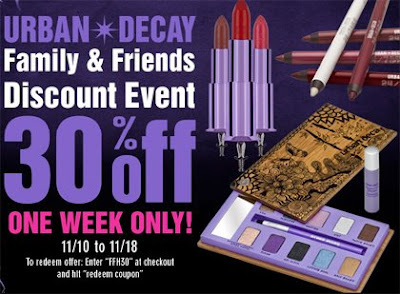 Urban Decay is having a Friends & Family Discount event starting 11/10-11/18. Use code: FRIEND25 for online orders. Bloomingdale's Friends & Family Discount 20% OFF all regular and sale purchases. are you shopping??? WOW! 50% off! I'll give it a go! thanks for the codes cutie! whatcha planning to buy at urban decay..??? ahaha I dunno why I did that yesterday, I was like having weird thoughts that some people might steal my pics coz I don't watermark them and stuff..haha and a lot more things..like my mom's cousin asking for my blog address..like wth,how'd she even know I had a blog in the 1st place..oh well.. So this is completely irrelevant from this post but I just wanted to thank you. You're asking for what...lol. A few posts ago you talked about Giorgio Armani's Face Fabric and I liked the results it gave you then I think I read about it in Cosmo so I figured it was a sign so I researched it then purchased and I MUST say I f'ing LOVE LOVE LOVE it! Only thing is the tube or box doesn't say what shade I am, unless i missed it. But really, I can't get over how much I love it. =) Although I'm new to this world of blogging it introduces me to new new new products! Woo! Hey girl, I decided to join ur contest. Pick whichever pix you want. on the 18th hardcandy is gna be 75% off!! !